You understand the value Microsoft Exchange Server can bring to your company but the internal deployment delays, administrative complexity and cost of Exchange just isn't practical. Business and technical executives strive to find time to focus on running their business and avoid the distractions of managing a 24X7 application such as Exchange. The time and expense of running a Microsoft Exchange Server in-house may simply be too much for a company your size. There is good news. This white paper will show you how you can follow the lead of tens of thousands of small and mid-size businesses who are already using Microsoft Exchange as a hosted service. 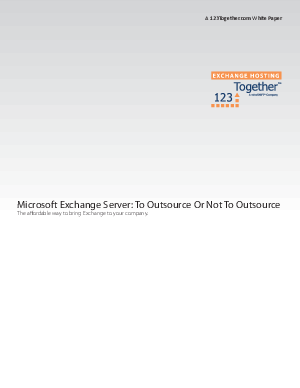 Hosted Exchange Server can provide your company with the full power of Microsoft Exchange without the high costs, deployment delays, drain on IT resources, maintenance and upgrade headaches.